In Europe, the arrival of the farmers who replaced Mesolithic hunter-gatherers happened in force 9,000 years ago but it was happening elsewhere prior to that. In Syria, there is even evidence of scientific trait selection in grains in 10,000 B.C. but in other parts of the world agriculture came much later. 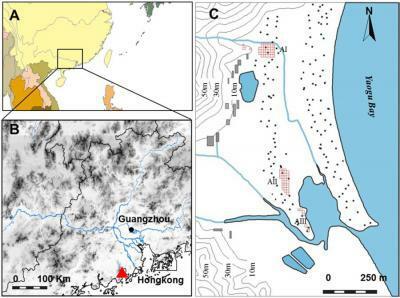 A region in sub-tropical China which did not have agriculture until the arrival of domesticated rice from elsewhere may have gotten agriculture prior to that - as far back as 3,000 B.C., according to a new paper. 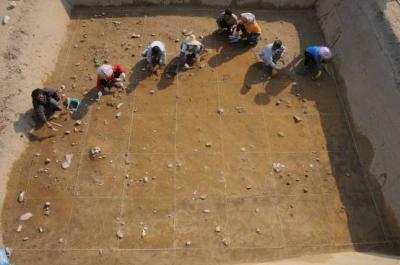 A new analysis of ancient grinding stones in Xincun has led archaeologists to hypothesize that agriculture could predate the advent of rice in the region. Dr. Huw Barton, Senior Lecturer in Bioarchaeology at the University of Leicester, described the find as 'hitting the jackpot': "Our discovery is totally unexpected and very exciting. "We have used a relatively new method known as ancient starch analysis to analyse ancient human diet. This technique can tell us things about human diet in the past that no other method can. "From a sample of grinding stones we extracted very small quantities of adhering sediment trapped in pits and cracks on the tool surface. From this material, preserved starch granules were extracted with our Chinese colleagues in the starch laboratory in Beijing. These samples were analysed in China and also here at Leicester in the Starch and Residue Laboratory, School of Archaeology and Ancient History. "Our research shows us that there was something much more interesting going on in the subtropical south of China 5,000 years ago than we had first thought. The survival of organic material is really dependent on the particular chemical properties of the soil, so you never know what you will get until you sample. At Xincun we really hit the jackpot. Starch was well-preserved and there was plenty of it. While some of the starch granules we found were species we might expect to find on grinding and pounding stones, ie. some seeds and tuberous plants such as freshwater chestnuts, lotus root and the fern root, the addition of starch from palms was totally unexpected and very exciting." Dr Barton said: "The presence of at least two, possibly three species of starch producing palms, bananas, and various roots, raises the intriguing possibility that these plants may have been planted nearby the settlement. "Today groups that rely on palms growing in the wild are highly mobile, moving from one palm stand to another as they exhaust the clump. Sedentary groups that utilise palms for their starch today, plant suckers nearby the village, thus maintaining continuous supply. If they were planted at Xincun, this implies that 'agriculture' did not arrive here with the arrival of domesticated rice, as archaeologists currently think, but that an indigenous system of plant cultivation may have been in place by the mid Holocene. "The adoption of domesticated rice was slow and gradual in this region; it was not a rapid transformation as in other places. Our findings may indicate why this was the case. People may have been busy with other types of cultivation, ignoring rice, which may have been in the landscape, but as a minor plant for a long time before it too became a food staple. "Future work will focus on grinding stones from nearby sites to see if this pattern is repeated along the coast."